We’d love your help. Let us know what’s wrong with this preview of Exit Ramp by David P. Spears II. Have you ever wondered how much that guy with the cardboard sign makes? One economics student did and he decided to find out. During the summer of his senior year at college, while earning a B.A. in Economics and Political Science, David P. Spears spent eighty hours undercover as a panhandler. Systematically recording every transaction at the exit ramp, Spears captured a ra Have you ever wondered how much that guy with the cardboard sign makes? One economics student did and he decided to find out. During the summer of his senior year at college, while earning a B.A. in Economics and Political Science, David P. Spears spent eighty hours undercover as a panhandler. Systematically recording every transaction at the exit ramp, Spears captured a rarely seen picture of how modern urban charity works. This book is the record of his adventures, part economic research, part investigative journalism. Both the numbers and the stories behind the numbers provide answers to the questions we’ve all been wondering: Who gives more to panhandlers—men or women? What percentage of drivers roll down their windows to donate? And most important of all, how much can a panhandler earn per hour? To ask other readers questions about Exit Ramp, please sign up. This review has been hidden because it contains spoilers. To view it, click here. So first, a disclosure: I won a free copy of this book through Goodreads! Yay! Thanks to the publisher for providing me with that opportunity. Especially since I recently moved about one exit away from where Spears did his research, I was quite excited to read this one. I essentially have two reviews of this book: the first is my review of the book as a piece of research, and the second is as a book overall. I've got to give Mr. Spears some props. It is not easy to write a book. I taug So first, a disclosure: I won a free copy of this book through Goodreads! Yay! Thanks to the publisher for providing me with that opportunity. Especially since I recently moved about one exit away from where Spears did his research, I was quite excited to read this one. I've got to give Mr. Spears some props. It is not easy to write a book. I taught college for several years while pursuing my PhD, and hearing of this project warmed the cold cockles of what is putatively my heart, since I would probably have cut throats to have a motivated student. All that to say, criticizing this book is a bit hard given that context. I liked that Spears narrowed his research question - in fact, he narrowed it almost too much, since the book itself (see below) is essentially a long run-up to the answer to a yes or no question. I also respect his methodology. Less ambitious people might have found a way to do this without direct participation, and that he was willing to stand and panhandle in his own community shows he has guts. However, I do take issue with some aspects of the study. First, while bearing in mind I'm no economist, I question the use of the term profitability here. I think Spears took a slightly simplistic view of the idea of profitability, as he seemed to work from the assumption that panhandling is pure profit and those who do it don't miss out on opportunity costs or otherwise have a full-time job available to them. For example, I assume there is some significant overlap between those who have payroll wages garnished and those who panhandle, which would certainly affect profitability, wouldn't it? There are fascinating variables here. Spears touches on gender, but only the race of the giver. I realize it's beyond the scope of his study, but he did not account for the fact that the fact he was a veteran clearly seemed to have increased some of his donations (e.g., the man who quizzed him on his service, gave $20, and then implied if he hadn't answered appropriately he would have assaulted him). I wonder if his conclusion (which I won't spoil here) would have been the same if he had had a vaguer sign about simply being poor and hungry, not a vet (however true that was in his case; I guess he certainly earned the right to say it!). If he had lied about being a veteran, he would have faced opportunity costs such as, apparently, assault. This leads me to another issue, which is the fact that panhandlers aren't necessarily scammers cynically playing off people's emotions, as many critics insist. In some ways they are very vulnerable, with absolutely no "workplace" protections. I'm not sure how this would factor into an economic analysis, but someone making slightly less money in a workplace with some safety precautions or at least an employer liable for there safety is likely in a better situation than someone making slightly more and subject to threats from competitors and customers alike. There is also an unspoken assumption that panhandling is somehow a superior "job" to minimum-wage work. I personally think the real answer is there are many, many people who simply cannot win or get ahead in this economic context and the proliferation of panhandling reflects desperation more than deception. Although this is outside the purview of the study, I also wonder about what panhandling "does" for the giver. I guess this is one of those sociological and cultural questions that interest me far more than economics, but I think it's important to look at panhandling as a two-way street. Obviously, in some sense, panhandlers are selling something, whether it's a feeling of smug superiority or just karma. It does something to the giver to provide for them. Therefore, perhaps the tone of the study - which at time seems overly critical of the poor - would best have been shifted in order to consider panhandling as the exchange of a service ("a good feeling") for money or goods. There's much to admire here, and certainly, I think this could pave the way to a larger study in any direction. For undergrad work, it is definitely superior. It's hard to turn a study that essentially answers a yes-or-no question and turn it into a readable and engaging book. At times, I think Spears found it difficult to balance the tone between "professional academic" and "folksy guy just like the readers." Some phrases and sentences absolutely made me cringe, such as when he asserted that he could tell a woman had pet cats just from the tone of her voice. I think he should have walked the walk, so to speak: either write in a consistent academic voice or write as a normal guy doing a funny summer experiment; the tone shifts are jarring. I have encountered this writing issue similarly among intelligent students struggling to find their own "writing" voice. Overall, and in a slightly more serious vein, I did think the book would have benefited from sounding less overtly critical of the poor. There are moments in the book when Spears seems to make rhetorical gestures designed to sound funny or cute, but that just sound immature at best. Assuming Spears continues writing - and despite the criticisms above, I certainly hope he does - he may want to work with an editor to maintain a tone that is professional, yet readable, and doesn't alienate entire groups of readers on the basis of superficial observation (cat ladies, represent). This is a sensitive, multifaceted topic, and therefore, it might be best to approach it with a similarly sensitive tone. Either way, it's short and definitely readable. I've read worse. This is an interesting, quick read. This was suggested to me in Prime reading. It was short, had a somewhat interesting title, and actually posed a question that I have wondered about myself. I don't regret spending the time reading it and would suggest it to my friends threadbare my inquisitive view on the world around us. When I was finishing my degree, by going to class two nights a week after work, I drove past two offramps that led to Wal-Mart's home office. Over the course of the semester, I saw what looked like the same two people at the intersections. I am now wondering how much money they made over the course of the semester? Reads like an economics thesis, but I had always wondered about how much the people at the highway exits made. Small sample size makes the results questionable. Interesting economic read but overall just an ok read. Nice to see that someone else has wondered about how much a panhandler can make in a day. I particularly like that he included the non-monetary gifts. Interesting study of something everyone wonders about. Scientific yet amazingly candid accounts of first person experiences on the corner. Recommend reading. I'm not usually into reading books about economics or statistics, but I thought the subject matter sounded interesting, so I gave it a shot. What a neat read. I feel like there's a much less dry way to tell this kind of story and make this kind of point (like Nickel and Dimed: On (Not) Getting By in America). It was interesting, but not at all entertaining. The author spent 2 weeks panhandling and collecting data about it. It was an interesting read. However, I think he has a lot of blind spots. He claimed he could get very accurate numbers about gender, but it's not like he asked anybody their gender, so he was just guessing. More oddly, he thought he could accurately guess people's race. Any surprise he didn't list anyone as mixed race? Cuz, he guessed! He does acknowledge, a little, that his gender and his status as a vet (that he used by putting The author spent 2 weeks panhandling and collecting data about it. It was an interesting read. However, I think he has a lot of blind spots. He does acknowledge, a little, that his gender and his status as a vet (that he used by putting on his sign) may have influenced how much he made. I don't think he mentioned his race there. Very nice, answers its single question well and with style. Maybe even too much style, but when you're writing an economic case study better to err on that side. I think ultimately sociological studies may prove more interesting than economic ones in this area. I've only known one former panhandler, and he averaged quite a bit higher than the author. The reasons for his continued panhandling were how challenging it was to find a job, and how much more profitable panhandling was. Similar reasons, Very nice, answers its single question well and with style. Maybe even too much style, but when you're writing an economic case study better to err on that side. I think ultimately sociological studies may prove more interesting than economic ones in this area. I've only known one former panhandler, and he averaged quite a bit higher than the author. The reasons for his continued panhandling were how challenging it was to find a job, and how much more profitable panhandling was. Similar reasons, incidentally, that most of the older waitresses I worked with gave for sticking in that similarly socially challenging occupation. I greatly admired the author's courage in doing the study - I felt the awkwardness of asking strangers for money as he was recounting his plan. Somewhat interesting but I do have some concerns with the the ethics of this study. The author posed as a needy Iraq vet seeking handouts at a highway off-ramp. In doing so, not only did he deceive the givers but also denied a possibly needy person of the opportunity to do the same at that location (this also denies a scammer to chance to take money inappropriately, depending on the distribution of truly needy to scammers). What did we gain from this deception - a narrow band SPOILER at the end. Somewhat interesting but I do have some concerns with the the ethics of this study. The author posed as a needy Iraq vet seeking handouts at a highway off-ramp. In doing so, not only did he deceive the givers but also denied a possibly needy person of the opportunity to do the same at that location (this also denies a scammer to chance to take money inappropriately, depending on the distribution of truly needy to scammers). What did we gain from this deception - a narrow band of data with very limited usefulness (my opinion obviously). While I like the idea of this book (posing as a panhandler to see how profitable the practice actually is), I think it would have made a better socioeconomic research whitepaper. The chronology of the day-to-day interactions were kinda dull (except for the marine that was going to punch him in the face if he didn't back up his veteran-branded cardboard sign with some actual military bona fides). 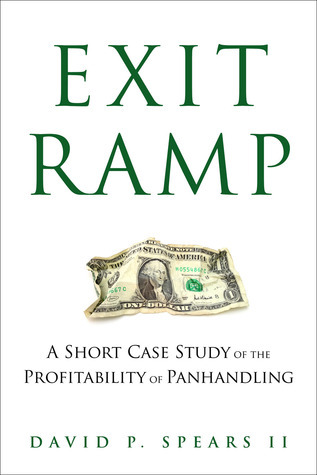 The author concludes that panhandling is more profitable than minimum wage employment. He goes on to While I like the idea of this book (posing as a panhandler to see how profitable the practice actually is), I think it would have made a better socioeconomic research whitepaper. The chronology of the day-to-day interactions were kinda dull (except for the marine that was going to punch him in the face if he didn't back up his veteran-branded cardboard sign with some actual military bona fides). A short read and it is very interesting. It answered some questions that I has always wondered about. However, it raised more questions that I would love to have answers to as well. Worth reading. I love that it is based on an exit ramp that I have actually driven past several times. I really like any story about somebody doing something that would make me too uncomfortable to do myself; liked how this 'study' found an answer to a common question. This was very short but very good. His sample was too small to draw too firm a conclusion, but it was fun to think about.